Wellington’s lively alternative arts scene attracts many artists and performers. Some examine city life. 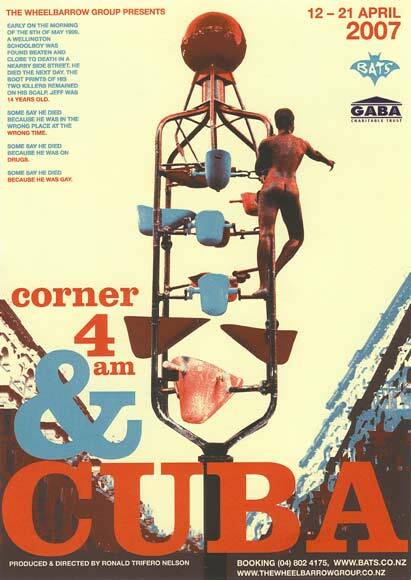 In 2007 the drama company The Wheelbarrow Group staged the confronting play Corner 4am and Cuba. It told the story of a 14-year-old boy who was beaten to death near Wellington’s Cuba Street in 1999. Some believe he was targeted because he was gay and flamboyant. This poster, from the Bats Theatre production, was designed by Graeme Offord, from a concept by Luis Portillo and Ronald Nelson, with photography by Damian Seagar.